FILE - A man rides a bicycle past damaged buildings in the Douma neighborhood of Damascus, Nov. 26, 2015. Monitors and security sources say a U.N.-brokered plan to evacuate thousands of jihadist fighters under siege near the Syrian capital has been delayed following Friday's killing of an anti-government rebel leader who was to guarantee safe passage to the militants. The evacuation of some 4,000 fighters and their families from southern Damascus had been expected to take place early Saturday. But the Britain-based monitoring group Syrian Observatory for Human Rights said the deal stalled hours after rebel leader Zahran Alloush was killed Friday in an airstrike near Damascus. Monitors say Alloush was prepared to guarantee the extremists safe passage from Damascus as part of a U.N. plan aimed at ending five years of civil war that has devastated Syria. Details of Alloush's death remain unclear. Some reports say the military forces of President Bashar al-Assad's government had killed him in an airstrike. Other reports say Russian airstrikes killed Alloush. Zahran Alloush, center, commander of Army of Islam, sits during a conference in the town of Douma, eastern Ghouta in Damascus, Syria, Aug. 27, 2014. The U.N. has not commented publicly on the evacuation deal's latest developments. But U.N. negotiators and foreign governments have in recent months stepped up efforts to broker a series of local cease-fires and safe-passage agreements to curb fighting. More than 250,000 people have died in the conflict, which has forced more than 4 million others to flee the country since it began in 2011. In a rare show of agreement, the U.N. Security Council unanimously approved a resolution on December 18 endorsing an international roadmap for Syrian peace. 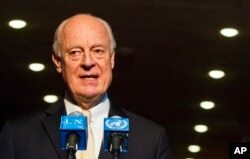 On Saturday, U.N. Syria mediator Staffan de Mistura said he aimed to convene peace talks January 25 in Geneva. He said those talks would include the "broadest possible spectrum of the Syrian opposition and others" and that they will require the "full cooperation" of all parties to the conflict. FILE - U.N. Special Envoy for Syria Staffan de Mistura speaks during a news conference, Nov. 19, 2015, at U.N. headquarters. Alloush was one of the most powerful rebel commanders seeking to topple the Assad government. He commanded thousands of fighters who control large parts of Eastern Ghouta and Douma, east of Damascus. This photo released Dec 13, 2015, by the Douma Revolution News Network on its Facebook page shows Syrians trying to extinguish fire that was caused by Syrian government aerial bombardment on the Damascus suburb of Douma, Syria. In his mid-40s, Alloush had studied Islamic law in Saudi Arabia and was released from a Syrian prison in 2011 as part of an amnesty and then joined the revolt against the government. His group defended an area that has faced repeated government air raids. 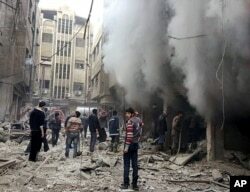 His forces, in turn, have fired mortar salvos at areas in Damascus, killing scores of civilians. His allegiances, however, were far from clear. While opposing Assad's rule, he also had issued statements that appeared sympathetic to Jabhat al-Nusra, the al-Qaida offshoot in Syria and al-Qaida's late leader, Osama bin Laden. But in a recent interview with The Daily Beast, a U.S. news and opinion website, Alloush distanced himself from Jabhat al-Nusra, claiming he supported only Abu Maria al-Qahtani, one of al-Nusra’s Sharia advisers. "We saw that Qahtani was showing a moderate face and we wanted to encourage those efforts," he said. "Now al-Nusra has different Sharia advisers, and ours have many disagreements with them, ideologically and intellectually." 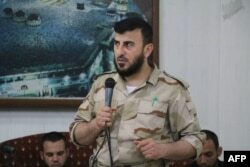 FILE - Zahran Alloush, head of the Army of Islam Syrian rebel group, speaks during the wedding of a fighter in the group in the rebel-held town of Douma, on the eastern edge of Damascus, Syria, July 21, 2015. Alloush also denied his organization wants to spread Sharia law in its areas of control. But he had plenty of criticism for democracy. "The democracy of Assad, the pluralism of the Baath [political party], and the Islamism of ISIS are a few examples. The Western double standards are also applied to democracy. While democracy is used to serve people’s interests in the West, democracy is manipulated in our countries to bring villains to rule as agents for outside powers," he said. He was also critical of the policies of the Obama administration toward the Syrian crisis. "America is a powerful country and it can play a major role to end the Syrian conflict if it wants. But the current administration refuses to play this role and acts with cold blood when it comes to Syria. It has failed to respond effectively to Assad’s massacres and we saw that obviously when Assad crossed the 'red line' on the use of chemical weapons. America was able to stop the chemical attacks, but it didn't care," he said. Geneva was the site of two rounds of U.N.-brokered peace talks early last year between Assad's government and rebels who have been fighting to oust him since 2011. Those negotiations ended with little progress, and momentum for a peace deal evaporated while the conflict became more complex with the addition of Islamic State militants seizing large portions of eastern Syria. But in recent months the push for peace has been renewed, including several international meetings bringing together world powers with a commitment to get the warring sides talking again.